Now a Gatorade spokesman, high-flying Paul George achieved a major breakthrough on the business side of the NBA. INDIANAPOLIS — Paul George is joining a new All-Star team. On Friday, Gatorade will introduce the Pacers’ budding star as its newest NBA spokesman in a lineup that already features prominent athletes such as Heat guard Dwyane Wade, Denver Broncos quarterback Peyton Manning, tennis star Serena Williams and Yankees shortstop Derek Jeter. In a video for the ad titled "Slam," George spins away from an opponent, takes off from the free-throw line and dunks the ball — with the sports drink streaming off him the whole way. For George, it’s a major breakthrough on the business side because he plays in one of the NBA’s smallest television markets. But the 23-year-old shooting guard began the transition last year after being selected to play in his first All-Star Game. He helped the Pacers push Miami to seven games in the Eastern Conference finals and was later named the league’s Most Improved Player. In September, Indiana rewarded George with a five-year max contract that could pay him as much as $90 million. He was elected as an All-Star starter last month and entered Wednesday night’s game against Miami ranked 11th in the league in scoring. The ad’s debut comes two days after George scored 23 points and had two monster dunks to help rally the Pacers (52-20) from a seven-point, fourth-quarter deficit to beat the two-time defending champion Heat 84-83. 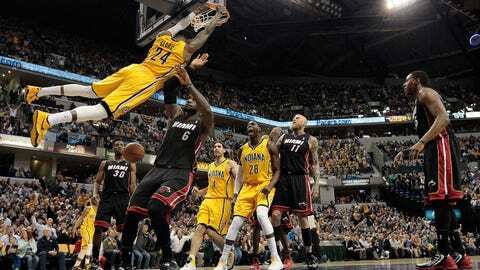 The win gave Indiana a three-game lead over Miami in the chase for the top seed in the Eastern Conference playoffs.